This is a question asked regularly by many engineers who have encountered repeated failures in attempts to repair cast iron with ordinary cast iron production welding rods. 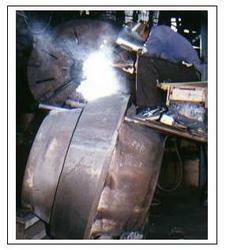 The answer to successful welding of cast iron is using WRTPL specially developed alloys. The following is the products range. WEARRESIST technologies was started by a group of technocrats in 1996 having collective experience of more than three decades in maintenance and repair activities of core sector industries like cement, power, mining, sugar, paper and oil drilling industry in the country. The X'TRALIFE concept was introduced by the company with the motto of"providing extra life to wear and tear prone components using the best available technology." This has resulted into improved machine availability and reduced shutdown costs for the core sector industry. Using breakthrough products & technologies, Wearresist is fighting the ravages of wear/tear & helping the industry to improve their bottom line.